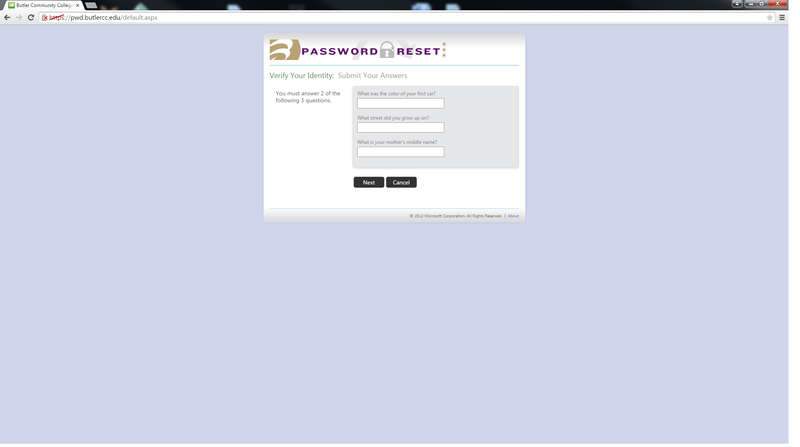 The self service password reset is done using your current password to register and fill out security questions and from that point forward you can go to another website and as long as you know your username and the answers to at least two for your security questions you can reset or unlock either account. 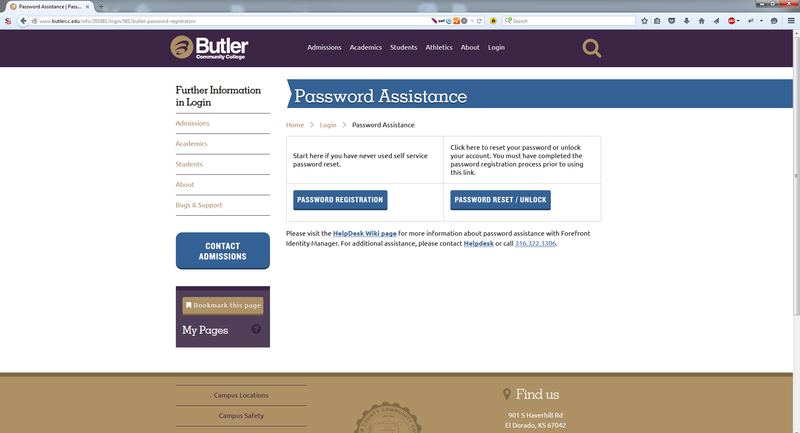 You must register your password before accessing any Butler resources. 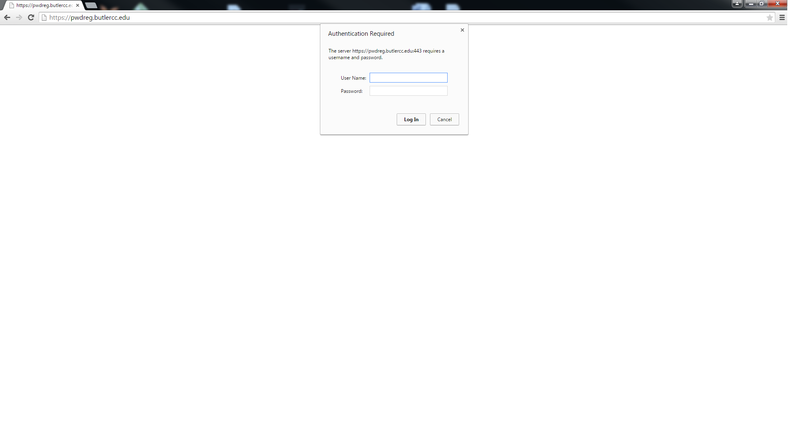 1 My account is "locked" what do I do? 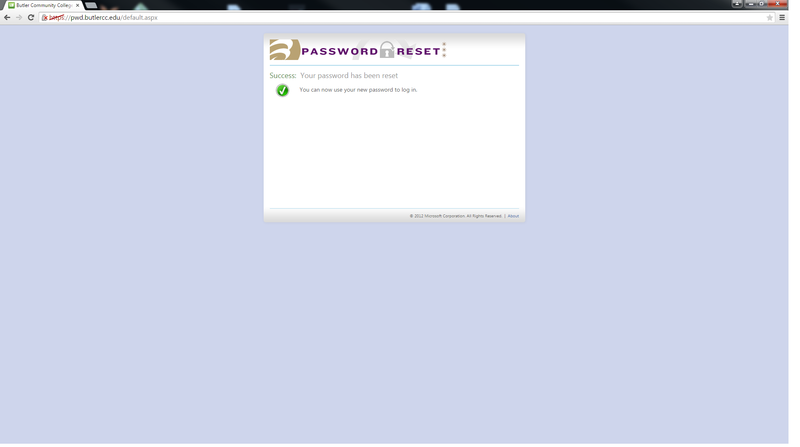 My account is "locked" what do I do? 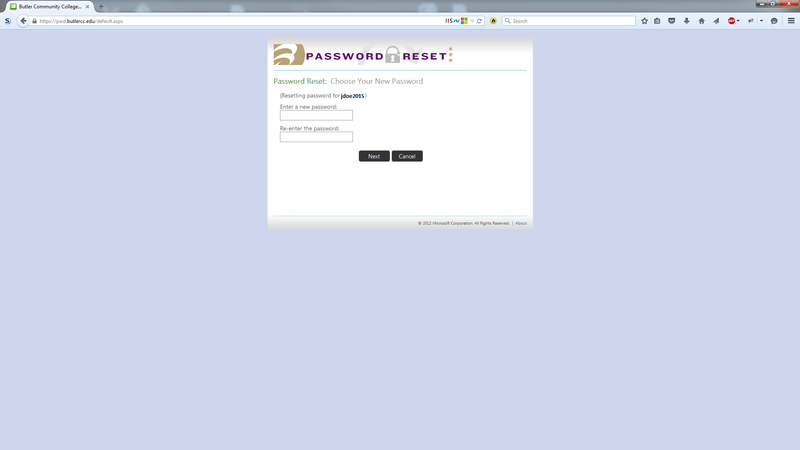 If your account is locked you can perform the below password reset and it will unlock your account. 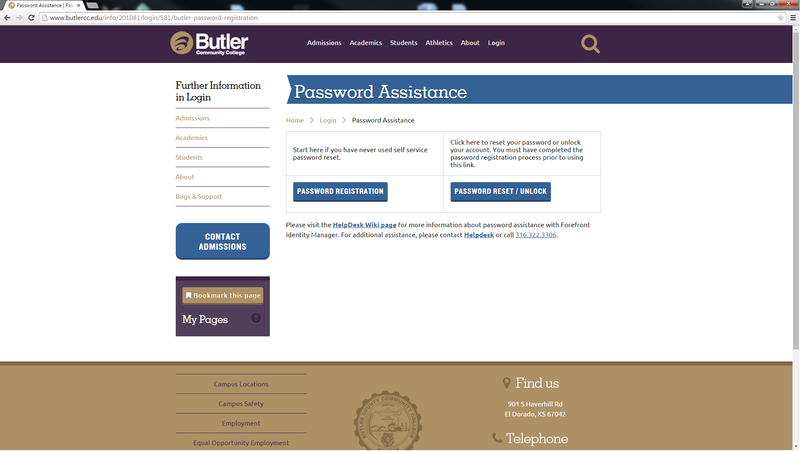 Note: Before changing your password, please ensure that all mobile devices using your Butler account login and password to connect to email, etc., are placed into "airplane" mode. After changing your password, update your password on your mobile device, too. Once that is done you can safely take your mobile device out of "airplane" mode. This will prevent your old password from being sent and potentially causing your Butler account to become temporarily locked. 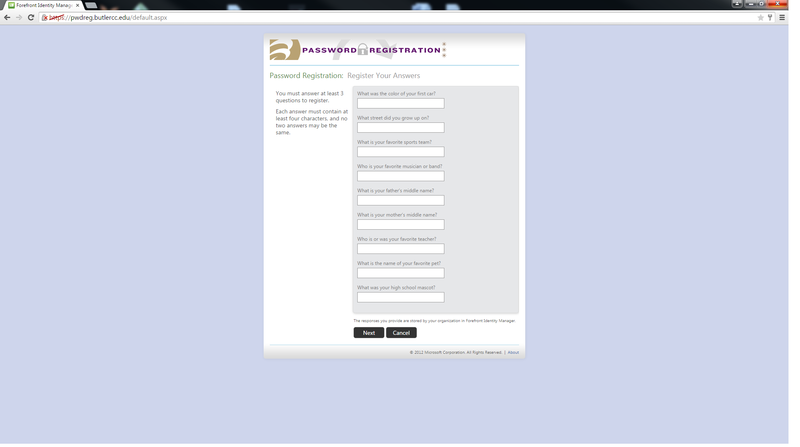 You will receive an email periodically starting two weeks before you password expires. this email contains a link to reset your password. 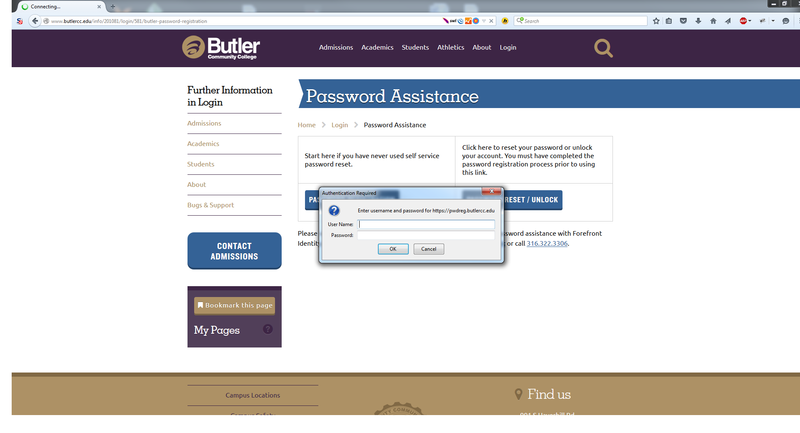 Your initial password is: your Butler ID numberBcc! 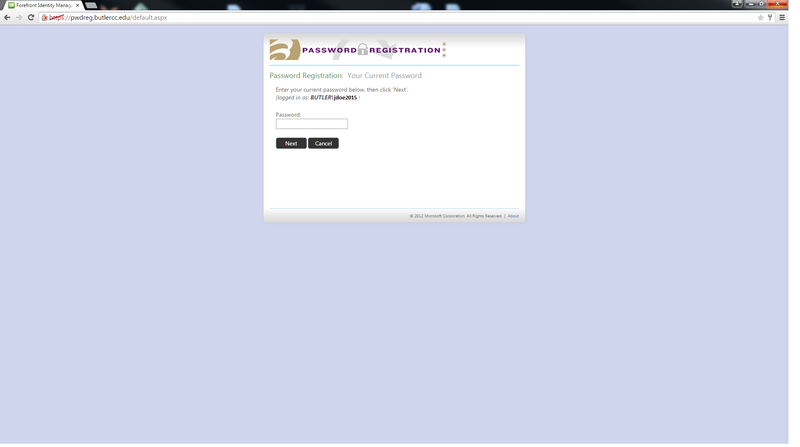 Your Initial Password is: @00000000Bcc! 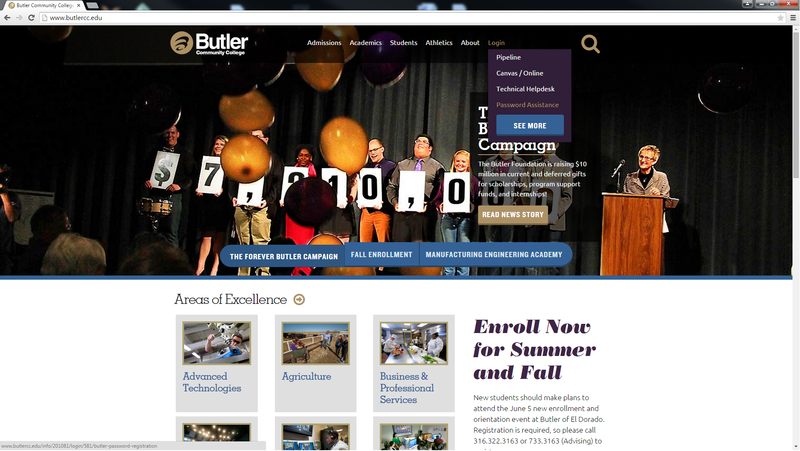 Different systems require different usernames to access Butler resources to access Canvas or Butler student email your login is username@butlercc.edu. 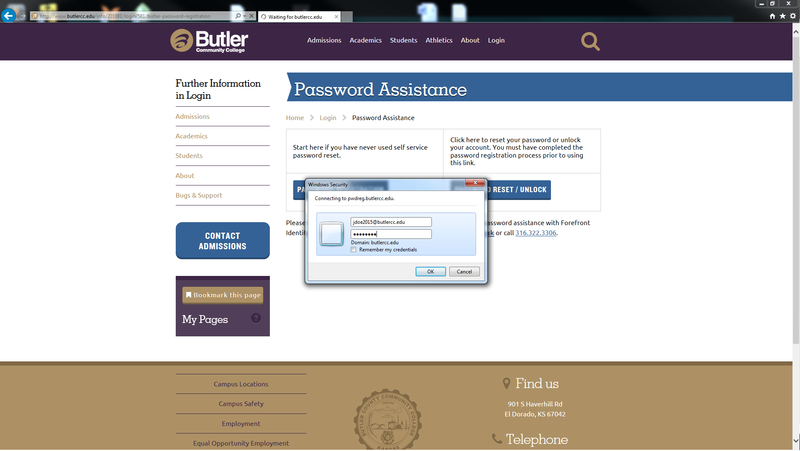 Accessing a computer on campus or pipeline your login is only your username. 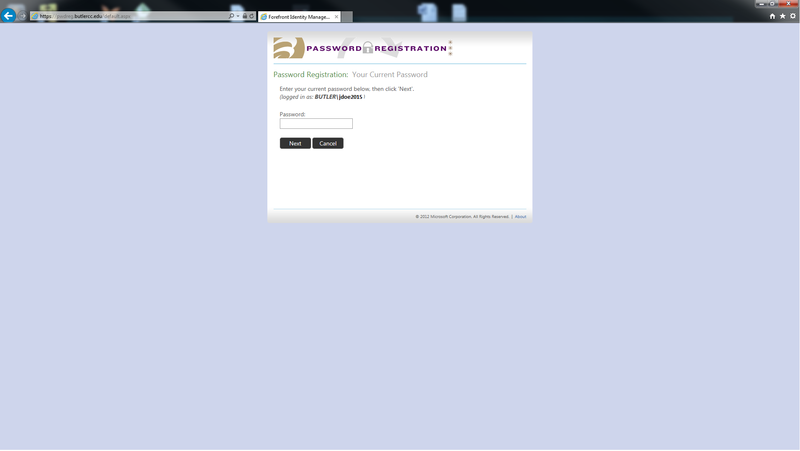 Hover over "Login" and select "Password Assistance"
Enter your Username and Password in the fields and select Log In. 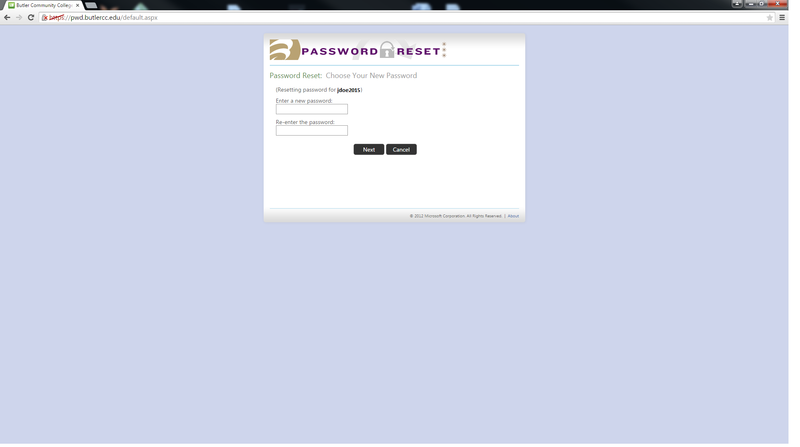 Answer a minimum of 3 security with answers that you will remember. Answers must be more than 4 characters long and are case sensitive. 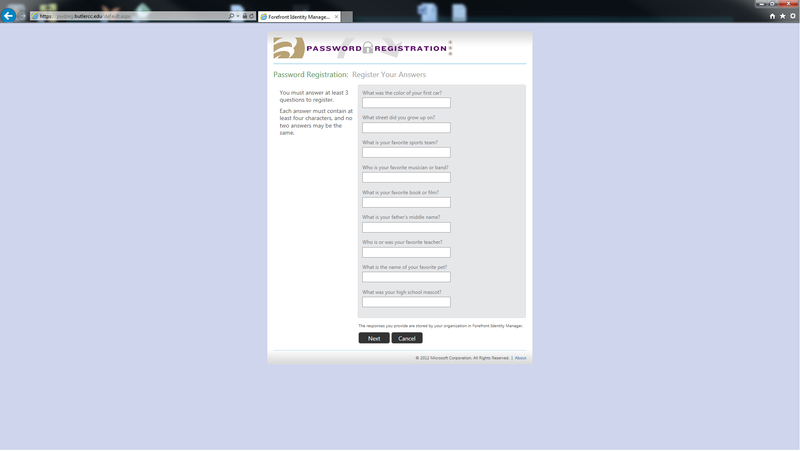 Once you get to the above screen with a green check mark you have successfully registered for password reset. 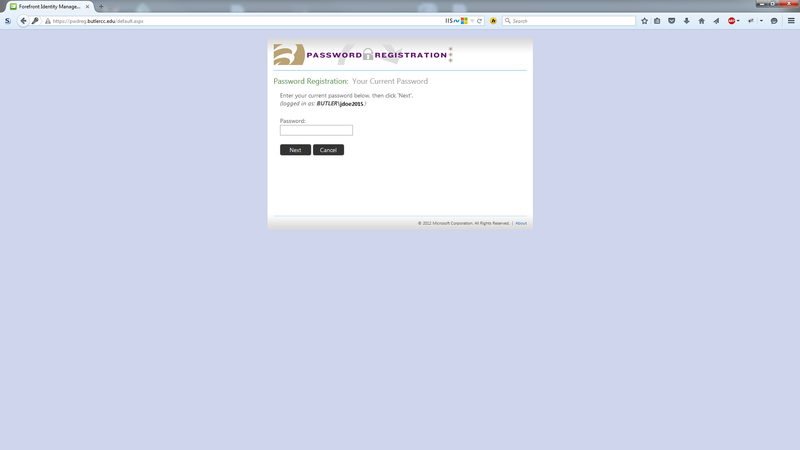 If this is your first time registering you will now need to reset your password. 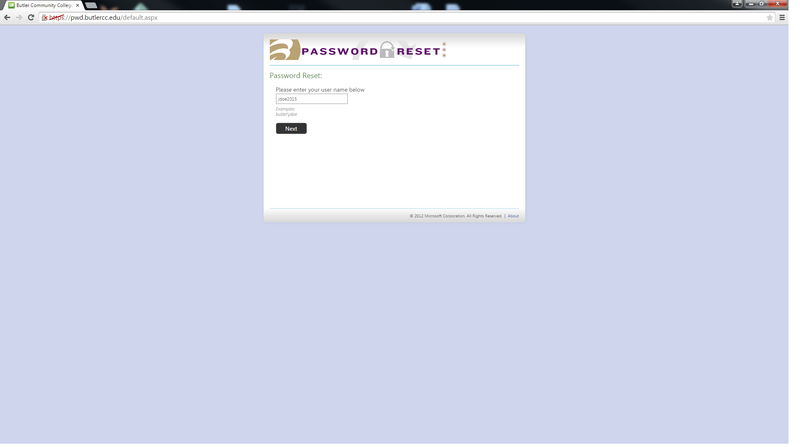 A box will appear asking for your Username and password. 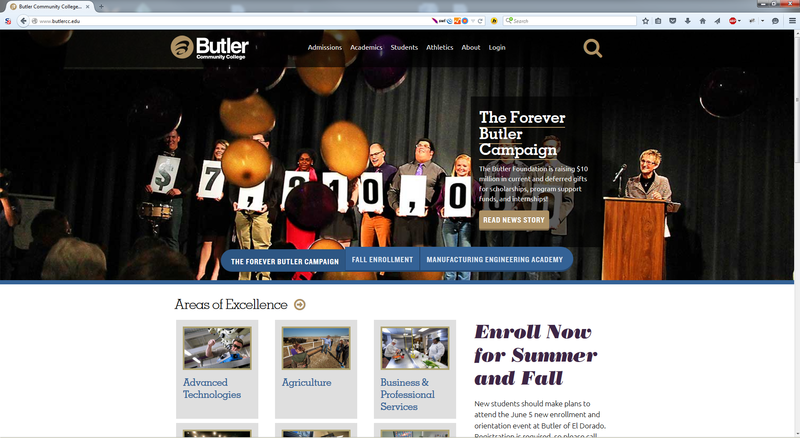 The username in this case is your email address (username@butlercc.edu). 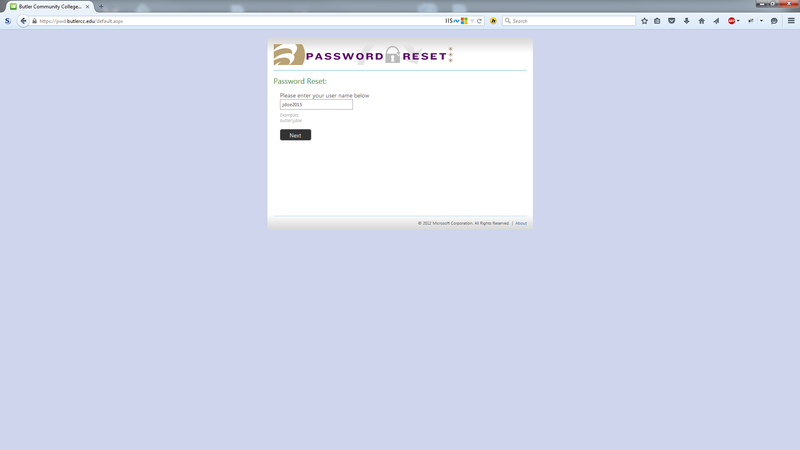 Hover over "Login" and select "Password Assistance". 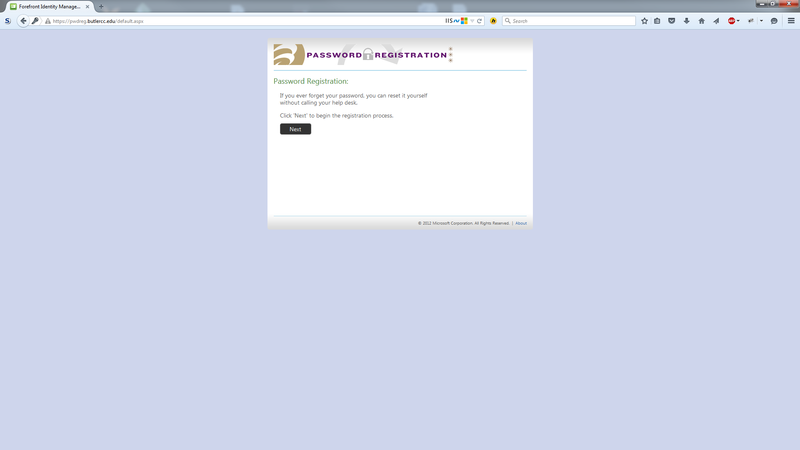 Enter your Username and select next. 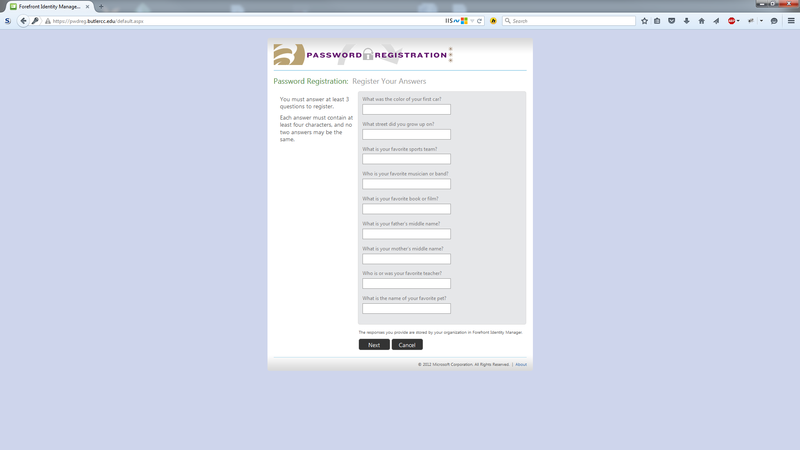 Answer two of the three security questions with the same answers used during registration. Enter a new password of your choice in both boxes and select Next. Passwords must contain three of the following: a capital letter, a lowercase letter, a number, and a special character (!,@,$,#,-,+, etc). 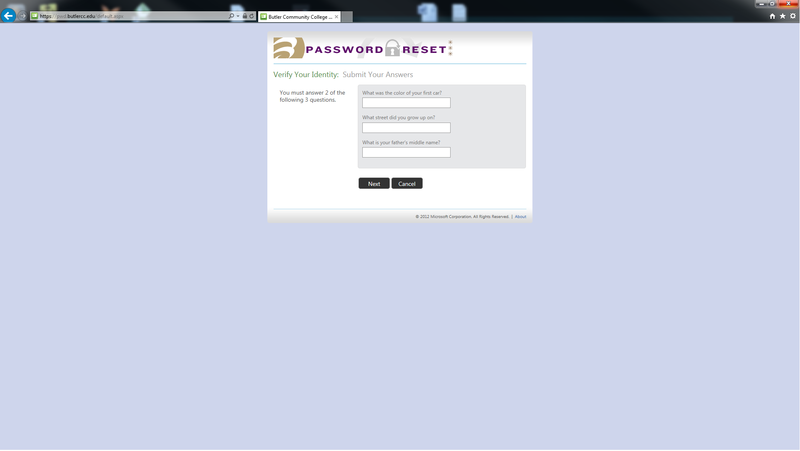 New passwords cannot contain your first name, last name, or username and must be at least six characters long. Once you get to the above screen with a green check mark you have successfully reset your password. 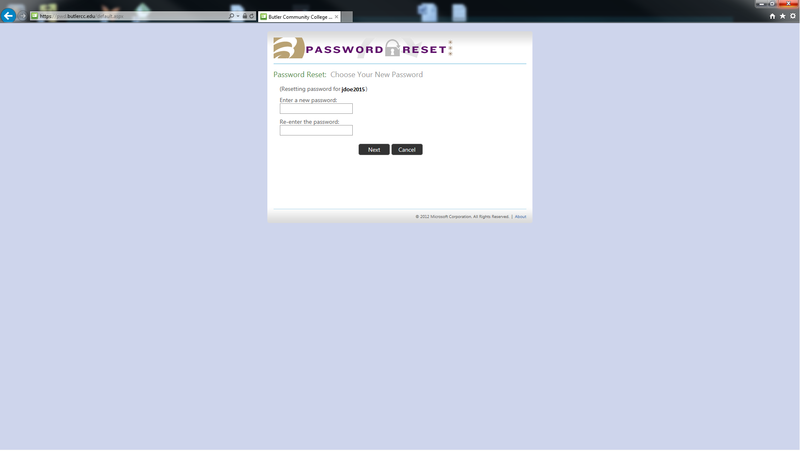 You may now login to all campus resources using your new password. 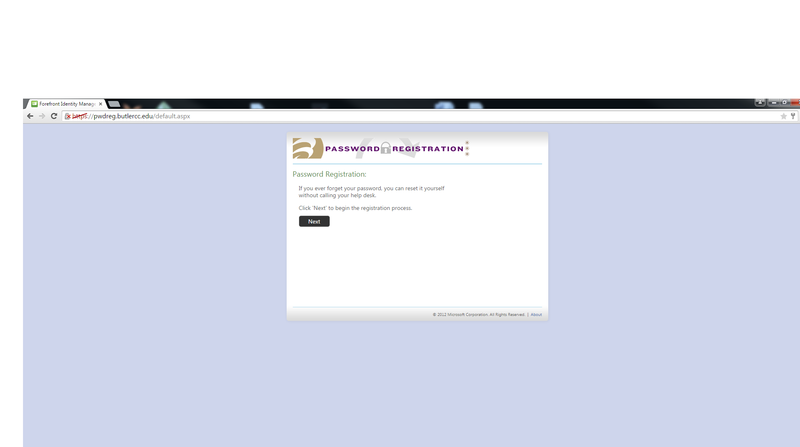 Passwords must contain three of the following: a capital letter, a lowercase letter, a number, and a special character (!,@,$,#,-,+, etc).New passwords cannot contain your first name, last name, or username and must be at least six characters long. 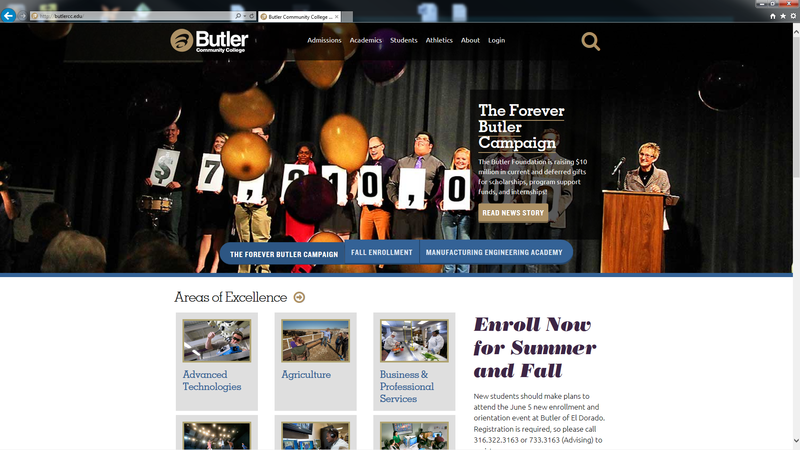 This page was last modified on 13 July 2016, at 09:40. 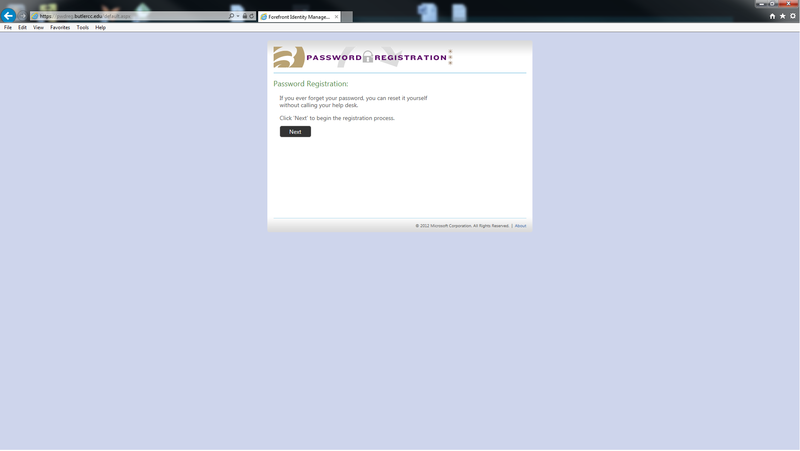 This page has been accessed 259,392 times.